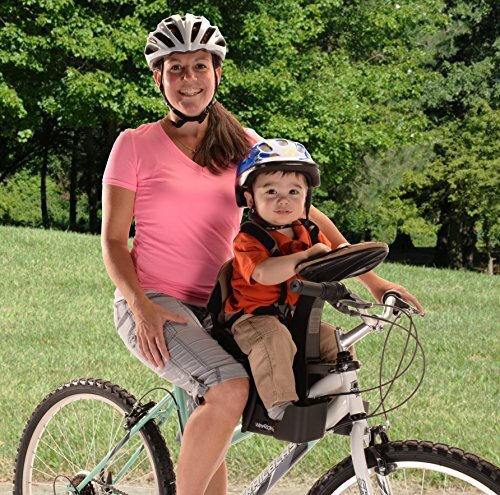 If you plan on carrying a toddler by bike, it is necessary to choose a child seat adapted to its size and age. Child seats can be installed at the front of the bike (on the frame, seat tube or steering tube) or at the rear (on the seat tube or rear rack). The type of seat and the position are chosen according to several criteria: duration and frequency of the journey, size and age of the child, type of bicycle , equipment needed, budget , type of journey (urban, cyclotourism …). Here are some tips to help you choose the seat that meets your needs. These solutions to take children on trips are, of course, to be adapted according to the size and needs of the child. The front seat is installed on the frame between the saddle and the handlebars. The child is close to the adult, in his arms and is therefore less inclined to move; You can see him and talk to him. In addition, the baby can see around him. This type of seat is suitable for urban , occasional or regular use. To improve handling, there is a Steco bicycle handlebar for a child seat which makes it possible to move the seat away from the saddle and thus to turn more easily. The cozy support makes it possible to transform a cozy into a baby seat. It attaches to the rear luggage rack at 3 points using a non-slip clamping jaw and heavy-duty straps. It is equipped with springs to absorb shocks and folds when not in use. It is suitable for daily trips and short walks. It is possible to carry your baby in a child trailer if it is equipped with a suitable seat . Nacelle-style seats accommodate newborns up to 6 months, hammock seats carry babies from 1 to 10 months and a child- friendly seat is suitable for young children aged 10 to 20 months . Simply remove the baby seat when the child grows up to install it in the original seat of the trailer. 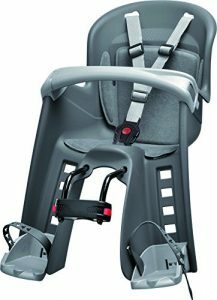 Children up to 5 years old must be installed in a seat adapted to their size and weight. Seats must be equipped with a safety belt or harness as well as a footrest . When the child starts to stand upright, it can be installed in the back of the bike or in a trailer. 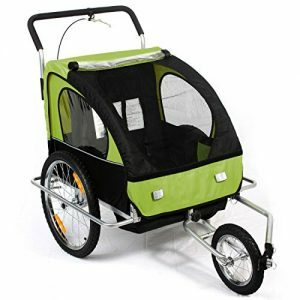 Bicycle trailers are suitable for long walks (some have push handles like a pram) or even longer cycling trips. They accomodate comfortably 1 to 2 children according to the models. Additionally, they can carry younger children if they are installed with a hammock seat. They attach to the rear wheel axle and can be compatible with pedestrian or jogging kits that convert the trailer into a stroller . The child saddles to fix on the bike frame are suitable for the junior child, become too big to travel in a seat. They offer a complementary but comfortable solution for daily trips . There are models suitable for male, female or Dutch-style bikes . It is advisable to equip yourself with footrest and a front skirt. The junior seats fit on the rear rack and accommodate a child of 25 to 35 kgs. Ergonomic and comfortable, they are equipped with a belt and a backrest. For added safety, you can mount a skirt protector on the rear wheel. The tow bar allows the child sitting on his bike to follow the adult bike safely. It attaches to the axle of the rear wheel or to the saddle tube of the adult bicycle. The child bike comes off in a few moments when he wants to pedal alone. When the child is tired or for difficult passages, it connects to the adult bike . A bicycle is a real means of transport and it is possible to take two or more children on a single bike. The double seat is fixed in place of the rear luggage carrier . It is equipped with 2 backs and 2 pairs of holds to be fixed on the stays. It comfortably accommodates 1 or 2 children and can support up to 60 kilos . The backrests are foldable and can be used as an extra luggage rack. One of the solutions is to install 2 seats on the bike . The smallest of the children can be installed in the front in a suitable seat and the second can take place in a seat in the back of the bike for example. For more stability when installing children, it is recommended to have a double stand for bicycles . Double child bike trailers accommodate 1 to 2 children, from 1 month (in a suitable seat) to 9 years, depending on the model. Adapted to long journeys, they have the advantage of being able to follow the growth of the child . In addition, they carry a baby in a hammock seat and an older child at his side. The Weehoo trailer is a special model. It is equipped with a single wheel for more maneuverability. Designed to tow 1 or 2 children between 2 and 9 years , it ensures a safety for the parents and comfort for the children. Very stable, it pleases children who can help to pedal and enjoy the landscape. The smallest can be installed in the back and stretch its legs through the feet. All you have to do is enjoy the ride . The front windscreen is attached to the bicycle handlebar or the stem . It protects the cyclist and the child from rain, wind, insects … It is very useful when the young child is installed at the front of the bike. For children over 5 years old, traveling in a seat that is not equipped with a footrest, it is essential to fit a pair of footrests on the bike. There are models that attach to the front on the frame , on the rear wheel axle or on the stays . Practices, they fold when they are not used. They can be used with cushions on luggage racks or framed saddles for example. The front skirt is a protection that covers part of the front or rear wheel . It is intended to prevent clothing from getting stuck in the shelves but they are also useful to prevent children from injuring themselves. The skirts prevent the children’s feet from rubbing against the wheel or getting caught in the shelves. With the footrests, they offer additional safety. The rain cover can cover the entire child seat or protect the child only. Convenient to put on, it makes it possible to arrive at destination in dry! Unlike the car, the bike is not provided with a protective cockpit, so it is always advisable to wear a helmet. There are models for babies from 10 months . To choose the model, think of measuring the head circumference then choose the style: pink, unisex, with visor, for BMX … The models are generally adjustable thanks to an adjustment wheel to follow the growth of the child. Some children are sometimes reluctant to wear a helmet. To make the helmet more fun, Crazy Safety has created a range in the form of animals : tiger, dragon, shark, zebra … For the biggest, there are BMX helmets united which also adapt to the practice of skate Or rollerblading. Carrying children can unbalance the bike. It is not always easy to install them while holding the bike firmly. To provide more stability to the cycle , it is advisable to install a double stand. The neck cushion keeps the head straight and allows the child placed in the seat to doze off. It brings more comfort and safety by cushioning shocks and jerks. Taking your children on your next bike ride can be a fun way to spend time together, and with so many child seat and bike trailer options available, there are options to suit your needs. Take a look at our wide range of Child Bike Seats and Child Bike Trailers.